The Cowdenbeath supporters’ proclamation that this victory was “just like watching Brazil” may have been an exaggeration but what is certain is they will now have the chance to see their team play Hearts and Rangers next season after securing their Championship status with a comprehensive victory over Fife rivals Dunfermline. 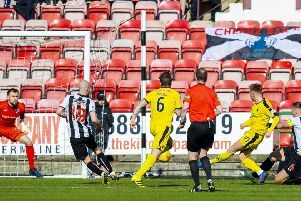 The Central Park outfit, nicknamed the Blue Brazil, surged ahead on the day and on aggregate after just 27 seconds via their prolific striker, Kane Hemmings, and the Pars could not muster the same kind of attacking prowess to produce a comeback. Defeat leaves the East End Park club, who are still rebuilding after administration, facing at least another year in League One, but the future is rosier for Cowdenbeath following a success that was made certain by second-half goals by Thomas O’Brien and Greg Stewart. “Financially, the difference is massive,” said Cowdenbeath manager Jimmy Nicholl. “In previous years I know for a fact that these directors have put their hands in their pocket to pay players’ wages. So, they’re getting an opportunity come next season to get all that money back and go and do something for the benefit of Cowdenbeath for years and years to come. I’m just delighted we managed to do it for them. “Football-wise, it’s so exciting for the players. I remember saying months ago to the players ‘your main goal should be the thought of running out at Ibrox and Tynecastle’. If that doesn’t motivate you to win a game of football, what does? They began all fired up yesterday, and incredibly they were ahead after just 27 seconds. Lewis Milne floated a free kick into the home box and O’Brien rose highest to nod towards goal. The Dunfermline defenders were caught on their heels but Hemmings was razor sharp and poked past an exposed Ryan Scully from seven yards for his 23rd goal of the season. Dunfermline’s Scully twice denied Cowdenbeath a further advantage before half-time, first stopping Hemmings after he had been sent through on goal by Stewart’s excellent flick and then foiling Dean Brett, whose volley appeared netbound until the on-loan Partick Thistle keeper’s intervention. The half drew to a close with Danny Grainger spearing a 20-yard free kick inches past for Dunfermline and the second period opened with Cowdenbeath’s Thomas Flynn brilliantly beating away a Josh Falkingham effort that appeared to be arrowing its way to the top corner. Ryan Thomson had a gilt-edged opportunity for Dunfermline in the 57th minute, but his free header bounced harmlessly wide. It was a costly miss because the Blue Brazil doubled their lead ten minutes later from a corner. Alex Whittle could only weakly knock the ball off the line as far as O’Brien and the midfielder returned it with interest into the corner of the net. Dunfermline’s mountainous task was now an impossible one with 14 minutes remaining. Falkingham blotted his copybook as he lost possession in midfield and that allowed Cowdenbeath to send Stewart one-on-one with Kerr Young inside the box. The clinical striker showed why he is bound for Dundee next season by moving deftly past his marker before drilling home to the delight of the visiting supporters behind the goal. “The big difference in the teams was that their front two caused us all sorts of problems and we’ve got four strikers out,” said Dunfermline manager Jim Jefferies. “But I’ve reminded the players we’ve had a fantastic season, we’re a young team and they’ve come up a bit short. Dunfermline: Scully, Martin, Young, Grainger, Williamson, Falkingham, Byrne (Forber 46), Geggan, Whittle (Husband), El Bakhtaoui, Thomson (Dargo). Subs not used: Goodfellow, Page, Morris, Millen. Cowdenbeath: Flynn, Brownlie (Stevenson), Armstrong, Wedderburn, Brett (Miller), Robertson, Milne, O’Brien, McKeown (Adamson), Stewart, Hemmings. Subs not used: Usai, Morton, Gold, Kane.